This boxed set from Belleek China features four miniature vases that are each enhanced with shamrocks. 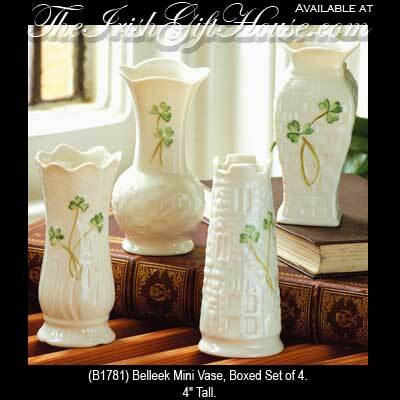 The four Belleek vases in this set feature green shamrocks. Each fine china mini vase is approximately 4" tall and they are handmade and hand painted in Belleek, Ireland. The miniature Belleek vases are gift boxed with a shamrock history card that is complements of The Irish Gift House.